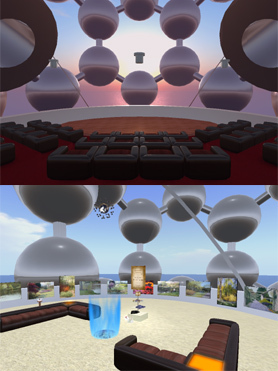 The Molecule Theater was created in April 2011 inside the existing Kira Molecule as a dedicated space in the Play as Being village for performing arts. Before then, the Kira Molecule and its exclusively solid atoms served merely as an impressive and much loved landmark above the Play as Being village. The original Kira Molecule was built elsewhere in 2008 with two habitable atoms that were originally scheduled for use as a multimedia arts centre. The center did not materialize and the hollowed out atoms were never used, so when the Molecule moved to the Play as Being village in 2010, those atoms were removed. In April 2011, work began afresh high up inside the Kira Molecule structure. Once again two atoms were used. The lower atom houses a Lobby - for meeting friends, providing information and housing temporary art exhibitions by local artists - and a garage to house vehicles for transport to and from the theater. The upper atom houses an artistes' gallery, a Green Room for performers and stage crew and the Molecule theater auditorium itself. The auditorium seats 36 people and there are facilities for managing sets, subtitles, spotlights, and the whole theater environment. A company of artistes called the Being Theater Players was formed to stage the premier performances in June 2011 with the hope of inspiring and supporting latent performance art talent with the growing Play as Being community. A series of workshops followed and Art as Being projects that include performance art offering can use the theater as their venue. Performances continue at the theater. A short video produced by one of Being Theater Players about its opening can be seen here: http://tinyurl.com/molecule-theater.